Diane Pastos pickets outside the Sheraton Boston by Marriott, where she works as an attendant, in Boston on October 3, 2018. On October 4, the New York Yankees were in Boston for the playoff series against the Boston Red Sox. A Boston Magazine reporter posted a video to Twitter of the Yankees walking into their hotel, the Ritz-Carlton. Under normal circumstances, this wouldn’t be newsworthy. This was different; the Yankees were crossing a picket line of unionized hotel workers who were striking outside the hotel. The players mostly avoided eye contact with the workers, keeping their heads down as they walked through the protest and into the hotel. Crossing a picket line is considered egregious enough, but what made it even more galling to some is that Major League Baseball players are themselves members of one of the strongest unions in the country: The Major League Baseball Players Association (MLBPA). 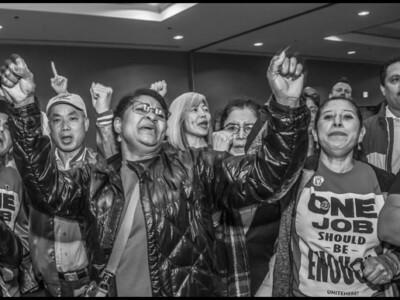 The hotel strike has been ongoing since October 3, after months of negotiations between the hotel workers’ union, UNITE HERE, and Marriott failed. It has grown to include workers in eight cities, including San Francisco, Oakland, San Diego, San Jose, Detroit, Honolulu, and Maui. UNITE HERE Local 26 is representing hotel workers at seven Marriott properties across Boston, the first to strike, as they fight for more consistent hours, greater job stability, job protection against automation, and increased protection from sexual harassment on the job. Thousands of workers have participated in the strike, according to the union. On Wednesday, two weeks after the strike began, Boston City Council unanimously voted to support the workers. For the striking workers, the actions of the Yankees players felt like a personal affront. “It was a huge slap in the face, honestly,” says Courtney Leonard, a 28-year-old server in the Birch Bar inside the Westin Boston Waterfront, where she’s worked for seven years. “They’re a union and we’re a union and we’re supposed to all stick together.” Why didn’t the Yankees players see themselves as allied with fellow union members in the hospitality industry? According to The Nation, the Boston hotel workers are at least 60 percent female and 85 percent Black, Latino, and Asian, and include many immigrants. “Housekeepers — by far the largest segment of the unionized hotel workforce — earn an average of $21.45 an hour, the equivalent of about $44,000 for those who work 40 hours a week year-round,” The Nation reported. By contrast, the minimum salary for MLB players is $545,000, and the average salary is $4.5 million. Baseball players officially gained union status in 1966, after struggling to get a foothold in the years before that. Their ability to become an officially recognized union came thanks to Marvin Miller, a former steelworkers’ union economic advisor and Brooklyn Dodgers fan. A year after Miller took charge of the union, the minimum salary was set at $6,000 ($45,984 in today’s dollars) and the average salary was $19,000 ($145,616). Under Miller, the MLBPA helped the players go from what Miller called “the most exploited group of workers I had ever seen — more exploited than the grape pickers of Cesar Chavez,” to a group with incredible strength and bargaining power. Over the years, this has allowed players to negotiate things from more control over their schedule to better travel arrangements to being able to achieve free agency, which would allow them opportunities to make more money and play in different markets. Over the years, there have been several player strikes in major league baseball, with players utilizing their collective power to demand better job conditions — like the UNITE HERE workers are doing in Boston. A Yankees player who makes $11.5 million per season, like Brett Gardner does, may not feel like he has much in common with the hotel workers he brushed past. But his job security and salary were negotiated through the same organizing tactics the UNITE HERE workers are using to negotiate theirs. What would it look like for members of the MLBPA to support the UNITE HERE strike? As union workers with considerably more power, the athletes could put pressure on Marriott by bringing attention to the strike and expressing their solidarity with the workers by not staying at Marriott-owned hotels while the workers are on strike. Instead, not a single New York Yankee — nor the team itself — has issued a statement of any kind, nor does it seem any individual athletes have, either. Not a single New York Yankee — nor the team itself — has issued a statement of any kind, nor does it seem any individual athletes have, either. Today, the MLBPA is run by Tony Clark, a former member who lacks the experience of the various labor lawyers that preceded him. With the exit of the staunch union men, it’s possible that players lack the kind of worker solidarity that may have existed at another point in time; MLB players haven’t been exploited and underpaid in the way they once were for decades, and it’s certainly not anything that the current crop of players has ever experienced. While many of the players have increased social status that comes with being a professional athlete, many of them are also children of immigrants or come from working class backgrounds. The upward mobility of the athletes themselves may help explain why the two unions have such comparatively different positions. Britni de la Cretaz is a freelance writer, feminist momma and recovered alcoholic living in Boston. Follow her on Twitter: @britnidlc. Chicago hotel workers want respect and a living wage from employers who get rich off their labor.